What's Not to Love About Yorkies? Good things come in small packages, and that certainly applies to the Yorkshire Terrier. These petite pooches were bred to catch rodents at clothing mills in Yorkshire, England, where the breed originated. Commoners weren't permitted to own dogs over a certain weight, so they kept smaller dogs to keep rats away from the cottons and linens. Of course, once the upper class discovered these lovable dogs, they quickly became pampered pets. Breed standard for these members of the toy group doesn't exceed 7 pounds. Their coats are typically black and tan at birth and become a dark steel-blue color at a mature age. Terriers have a lot of energy; you just need to make sure it's positive energy, not the nervous or aggressive kind. If you purchase your Yorkie from a breeder, pay attention to the behavior she displays. Make sure she's friendly and playful, not hiding in a corner. Also check the dog's mouth to make sure his bite is right. You'll want to have your veterinarian conduct a pre- and post-bile acid test, which tests liver function before and after a meal, to make sure your new puppy doesn't have a liver shunt. A liver shunt is a fetal blood vessel in unborn puppies that bypasses liver tissue and allows the mother's system to filter out toxins. In some dogs, this shunt stays open once the dog is born, which can seriously impair liver function and cause serious illness or death. I start housebreaking my puppies from the beginning with Four Paws Wee-Wee Pads. As with any dog, use positive reinforcement. Celebrate when they do things the right way, and ignore the mistakes rather than yelling or screaming. I say, "Yay!" and give them treats. I teach my puppies to fetch a toy and to bring it back to me as soon as possible. I play games with them and train them to walk on a leash too, so I have control. I suggest a step-in harness rather than a collar, because you don't want to put any pressure around your dog's neck. Collapsing tracheas are very common among toy breeds, and they can be directly caused by collars. I also crate-train puppies immediately so they feel comfortable if they ever have to stay in one. Size isn't a barrier for these Terriers. They're brave, determined and lively, and they can do many things a larger dog can't! My dog loves to bring her toys to me and play fetch. Yorkies also enjoy playing flyball and going on walks. They're quite adaptable and do well with obedience work. Yorkies are also very social. They like children and animals and they love being around their people, so they're not going to do well unattended outside in the yard. A Yorkie needs to be in the house, treated as a member of the family. Many people even take Yorkies to work with them. Mine accompanies me everywhere. As Terriers, Yorkies have a hunter instinct, and they think they've got the size of a Great Dane. But you have to be in control of your dog. The only time I've seen Terriers with biting issues is when the dog appears to be neglected or abused. If you're a responsible dog owner and provide your dog with adequate love, exercise, socialization, veterinary care and a proper diet, you shouldn't have any issues managing these confident canines. They really just want to please you. They're fun, loyal, smart, attentive, and -- in my opinion -- almost like humans. They're everything you could possibly want in a dog. 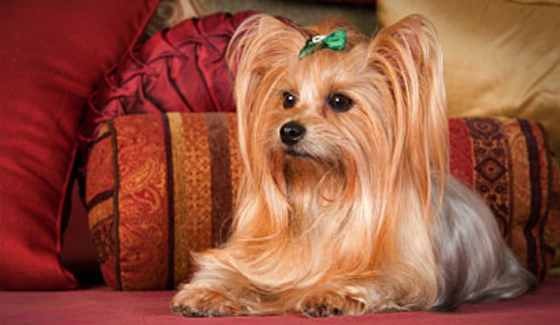 Mary Elizabeth Dugmore has owned Yorkshire terriers since 1972. She has bred them and shown them, and has helped rescue more than 3,000 Yorkshire terriers since she got involved in Yorkie rescue in 1997. Pets | Dogs: What's Not to Love About Yorkies?